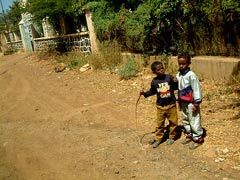 Although information on the situation facing children in Eritrea is monitored, it is clear that the young Eritrean population lives in extremely difficult conditions. Very few children are in a position to assert all their rights. In Eritrea, half the population lives below the poverty line. The gross domestic product (GDP) is one of the lowest in the world, which means that on average, an Eritrean person earns 100 times less than someone in Spain. Children are the most vulnerable when it comes to the consequences of this scourge. Their welfare is largely compromised. In Eritrea, the law only forbids corporal punishment against children under the age of 15, which seriously endangers their physical and mental health. This means that punishment judged to be “reasonable” is legal. It is therefore widely accepted and practised by the population. As a result, thousands of children are victims of violence in both the family setting as well as at school. Families are unaware that such punishment has an impact on the health and dignity of the child. Furthermore, the perpetrators of inhuman and degrading treatment of children are sometimes police and the military. For example, many children in prison are ill-treated and cruelly tortured. Some recent efforts have seen success in improving children’s health in Eritrea. However, the situation is still dreadful, particularly in terms of statistics, which show an infant mortality rate of 55% for example. Children’s lives are often endangered by disease, a lack of vaccinations, poor hygiene and so on. Health services are mainly concentrated in urban areas, which considerably restricts healthcare access for children living in rural areas. Only 5% of the Eritrean population has access to improved sanitation facilities. As a result, hygiene is severely lacking in the majority of villages with a lack of toilet facilities, healthy washing areas, soap and so on. The prevalence rate of AIDS in Eritrea is very worrying. The number of HIV-positive people is constantly on the rise. Further infection could be avoided through greater prevention and increased awareness of the virus among children and mothers. There is also a lack of care and support for those affected, despite recent progress. As well as affecting children’s physical health, AIDS also has an impact on their lives in general. For example, many of them are made AIDS orphans through the death of their parents. Tragically, their future prospects become dimmer because of this. 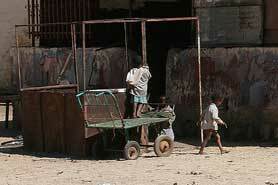 Sadly, there are an increasing number of children living on Eritrea’s streets. They are vulnerable to traffickers and often are more likely to become victims of trafficking or prostitution. Street children often use cannabis, alcohol, or inhale petrol fumes to escape their harsh reality. These extremely tough living conditions sadly have a negative impact on young people’s physical, psycho-social, cultural, and economic development. Despite efforts that have been made in this area, not all Eritrean children are guaranteed the right to an identity, particularly children from minority communities. Yet, registering a child’s birth and granting nationality ensures the child’s legal status. So, for those children whose identity is not registered, they are not officially recognized as a member of society and therefore are not in a position to assert their rights. 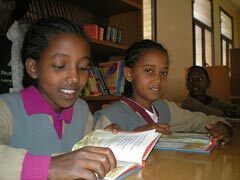 Eritrea has the world’s fifth poorest education system, with only 39% of children attending school. In particular, children living in rural areas experience the most difficulties in getting to school, sometimes having to walk several kilometers in blistering heat to get to class. Furthermore, many families are nomadic, which restricts their children’s access to education. Families in Eritrea generally refuse to let young girls go to school. Their futures are already mapped out – they will be married as early as possible so there is a belief that school education is not required. Furthermore, the facilities available in the education system are very poor, with completely out-dated or non-existent text books, buildings, sanitation facilities and so on. The Eritrean government officially outlawed female circumcision in 2007. 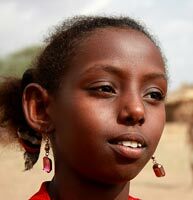 However, in 2009, 60% of young girls in Eritrea were still affected by genital mutilation. This mutilation is carried out in an unsafe and unhygienic environment, which often has serious consequences for the health of the young girls. The practice often results in infections, bleeding or other problems. Although the legal age at which they can get married in this country is 18, almost half of young Eritrean girls are married before the age of 18. However, customary laws allow marriage at a much younger age, in some cases at just 13 years old. Furthermore, the number of children in this country who are married very young is steadily rising. Child marriage has a negative impact on the child’s health, development and ability to assert their rights. When young girls marry at a young age, their social interaction is limited as they give up their education. Furthermore, they are at risk of early pregnancy, which can endanger their health and the health of their child.